Labour’s plan to introduce a 50% rate of Income Tax for high earners with effect from April 2010 has sparked a surge of activity in the property market in Guernsey, where recent high-profile incomers include private-equity supremo Guy Hands, one of Britain’s richest businessmen, who moved to the island in May. Mr Henry adds: ‘The market may have slowed, but open-market prices have hardly fallen at all.’ He quotes a guide price of £4.75m for eye-catching Fieu le Rouet, with its soaring roofs and three-storey tower at Les Vardes, on the southern edge of St Peter Port. But not only does the house form part of the Guernsey skyline, it also boasts some of Guernsey’s most dramatic sea views: from the north of the island, Alderney and the French coastline, to the harbour at St Peter Port itself, the floodlit Castle Cornet and the offshore islands. Fieu le Rouet stands in a private one-acre walled garden and has a reception hall, two reception rooms, a twin-level conservatory with an indoor pool, four bedrooms and four bath/shower rooms. And £4.25m is the guide price quoted by Swoffers for imposing Vue du Lac at Fermain, near St Peter Port, which stands in 3.8 acres of beautiful gardens and grounds on the slopes of a wooded valley leading down to one of Guernsey’s most picturesque bays. Built of the soft pink local granite, the house has been substantially extended and refurbished by its English owners, who plan to build a new house elsewhere on the island. Vue du Lac has entrance and reception halls, drawing and dining rooms, a farmhouse kitchen/family room, a suite of leisure rooms, including a library and a spectacular pool room, and five bedroom suites. Over in Jersey, Philippa Evans-Bevan of Savills’ newly established property-management arm in St Helier has noted a change of pace in the market, too. Jersey itself has also moved up a gear, she says, and is now attracting younger families from all parts of Britain, thanks to much-improved airline connections and good schools, such as St Michael’s prep school and Victoria College in St Helier. Unlike Guernsey, Jersey operates a stringent financial qualification process for prospective residents, so a spur-of-the-moment move is rarely an option. On the other hand, given the finite number of houses available for sale in Jersey, such regulation undoubtedly helps to keep price levels more or less stable. Jersey-born Michael Dean, who heads up Savills’ Jersey sales operation, has counted many properties in, and is now counting some of them out. The pick of his current port-folio is Beau Desert in Rue de la Retraite, St Saviour, three miles north of St Helier, for which Savills (01534 722227) quote a guide price of £5m. a swimming pool and a pool house with a gym and a sauna. The enthusiasm of its owner, a passionate gardener, is particularly evident in Beau Desert’s (pictured) enchanting botanical gardens, first created in 1903, where a phenomenal range of species continues to flourish in the benign Jersey climate. Having sold Victorian Pont Marquet House and its adjoining two-bedroom cottage in St Brelade to its present owners some 26 years ago, Mr Dean suggests that the rambling, three-storey, six/seven-bedroom house now needs ‘a bit of titivation’, hence the realistic £1.35m asking price quoted by the owners, who are downsizing. The ideal family house, Pont Marquet stands in 1.7 acres of sunny, west-facing gardens and grounds bordering the Railway Walk in a particularly pretty part of St Brelade. If time and speed are of the essence, then Knight Frank (020-7629 8171) and St Helier-based Le Gallais (01534 766689) are offering that rarest of specimens, an ‘unqualified’ Jersey residence that is, a house that anyone can buy and live in without purchasing restrictions. Small, but perfectly restored, Les Petit Cateaux in Trinity parish has two reception rooms, a kitchen/breakfast room, an orangery, three bedroom suites, and a ‘fabulous’ Mediterranean swimming-pool area. It also has planning consent to considerably extend the house. 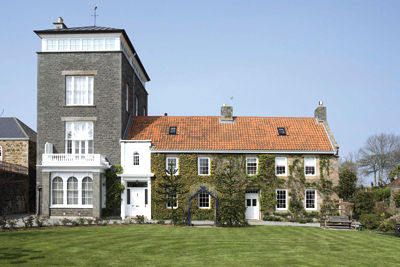 The agents quote a guide price of £2.25m for ‘the ideal getaway, lock-up-and-leave or family home’.